Hunting effects many things, including our own environment. Although generally most of the affects are negative, there are some positive effects to the environment. The positive effects include population control. Hunters kill animals that have large population, and this can cause those animals to die out due to the lack of food. Hunting these animals will help with population control.The money hunters spend on their hunting licenses is pumped back into programs that help protect and enhance wildlife and the environment. If hunting is well regulated, as sports or recreational involvement, there are no major affects to the species, if anything it may help bring back species from the edge of extinction. Many wildlife managers view sport hunting as the principal basis for protection of wildlife. Having said that, there are also many negative affects to hunting, which complete overshadow the positive effects. Hunting affects the biosphere, which is where the living organisms exist, it affects the biosphere because wildlife is directly related to the biosphere and hunting disrupts natural order. Over hunting will cause the decline in the particular animals species, this will effect everything around it, for example other animals, plants and trees. It directly affects the natural environment in that it throws off natural predation and population growth of the wildlife. Hunting also disrupts migration and hibernation of the animals. This is because when animals go to migrate, they may be killed by hunters and due to fear, they may not hibernate. The hunters themselves go on hunting trips, which causes them to drive long distances until they reach a hunting ground. This causes them to emit CO2, adding to their carbon footprint. Once the hunters arrive at their desired location, they usually set up a camp site. At the camp site there are campfires and a lot of littering, which is harmful to the wildlife. The smoke that is emitted by the fire negatively impacts the animals, and the litter on the ground may cause animals to choke. These affects endanger both wildlife and the environment. Another serious threat to the environment and wildlife is the illegal form of hunting, which is called poaching. Legal hunting cuts down over hunting by poachers due to the fact that hunting has strict laws against over hunting. Legal and seasonal Hunting protects habitats and preserves wilderness ecosystems. Hunters continue to serve as wildlife managers. 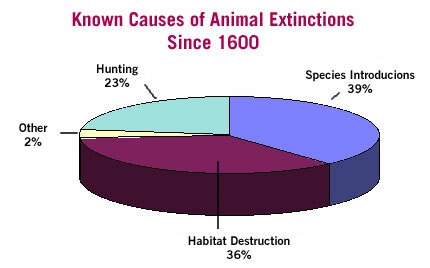 This graph illustrates the known causes of animal extinctions since 1600. Hunting is ranked as the third most known cause of animal extinction, at 23% of extinctions due to hunting. This is a massive number of animals becoming extinct due to hunting, and can be reduced if strict laws are inflicted, and hunting is reduced, to a manageable number. 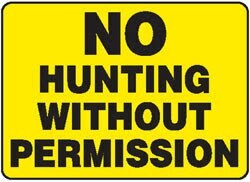 "NO HUNTING WITHOUT PERMISSION Sign." Lettering, Road Signs and More! Web. 11 Dec. 2010. .
Tutorial. Web. 11 Dec. 2010. .
Naturelles De L'Ontario. Web. 11 Dec. 2010. .
"Hunting in Ontario." Google. Web. 11 Dec. 2010. .
"Wildmeat: Overhunting Threatens Species And People." Environment & Technology. Web. 11 Dec. 2010. .
"YouTube - PETA Admits to Killing Thousands of Its Rescues." YouTube - Broadcast Yourself.Web. 13 Dec. 2010. .
"YouTube - NRA Hunting Debate with PETA." YouTube - Broadcast Yourself. Web. 13 Dec. 2010. "Hunting and Trapping Benefit People and Wildlife." DNR. Web. 13 Dec. 2010. .
"CIC Wildlife: Hunting For Truth - Why Rationalizing The Ritual Must Fail." CIC Wildlife: Latest News. Web. 13 Dec. 2010. .
Kenny Randhawa. Awesome Inc. theme. Theme images by sndrk. Powered by Blogger.